Do you have dozens of loose recipes floating about? Are you unable to find the recipe you want when you want it? If so, you are not alone. As you know, recipes can be recorded in a variety of ways from cookbooks to cards to printed pages to electronic files. Each type of recipe may require a different method of organization. ​Check out these tips about how to organize recipes. Implementing them will not only help to declutter your kitchen, it will expand your culinary repertoire at the same time! You will likely come across many different ways to organize recipes. You may be tempted to duplicate one or more of these methods. That's fine, but remember that what works for someone else may not work for you. The best method is the one that compliments your lifestyle and your recipe collection. For example, just because your mother's recipes are all hand written on matching recipe cards, that doesn't mean that yours needs to be. Maybe you get all your recipes off the Internet. Are you really going to take the time to recopy all of your recipes onto cards? I don't recommend it. Let’s look at specific ways to organize different types of recipes. Cookbooks are pretty simple to keep organized. All you really need is a shelf. The problem is, it can be difficult to find shelf space in an already crowded kitchen, particularly if your cookbook collection is large. Whenever possible, cookbooks should be stored in the kitchen since that is where you use them. Try to avoid using up precious counter space for cookbook storage if at all possible. Instead, look for a good place to hang a wall shelf. Another option is a freestanding set of shelves or a cabinet (see Movable Kitchen Storage). 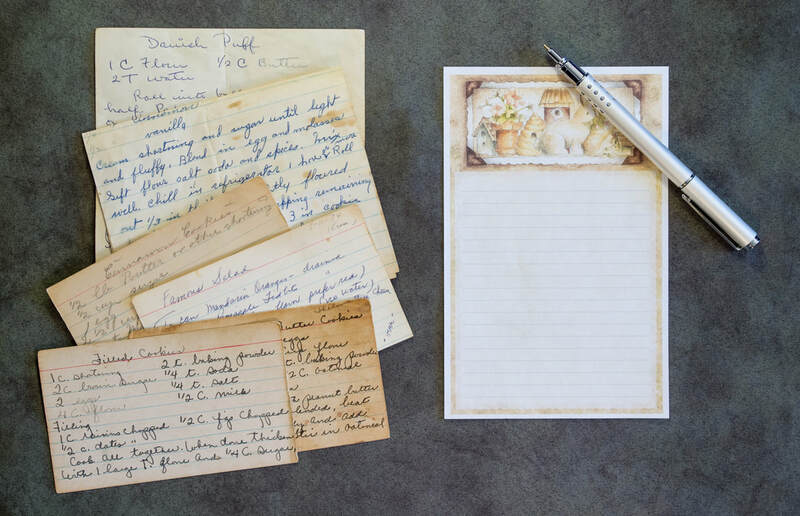 Recipe cards are an old favorite method to organize recipes. They have several pros and cons. On the plus side, all your recipes are recorded in the same format making them easy to organize. In addition, they are compact, thus taking up minimal space. They are also easy to transport as a set or individually. You can take out the one recipe you need and then replace it once you are done. Similarly, it is easy to add new recipes without wrecking your organization. Personally, I'm not a fan of recipe cards. For one thing, a lot of my recipes are too lengthy to fit on one little card. Also, in my experience it's next to impossible to find the same set of cards once you run out of one kind. As an organizer it bugs me when things that are supposed to match don't. Of course you could just use plain white index cards, but where's the fun in that? Lastly, very few recipes come to me on a recipe card, which means I have to copy it onto the card in order to add it to the collection. That is an extra step, and it is always best to try to avoid extra steps when it comes to organizing. It can be challenging to organize recipes when your recipes exist in a variety of formats. How do you keep track of recipes clipped from magazines, printed from the Internet, and collected from friends and family? One option is to copy them into another format (such as onto recipe cards), but that is time consuming and inefficient. 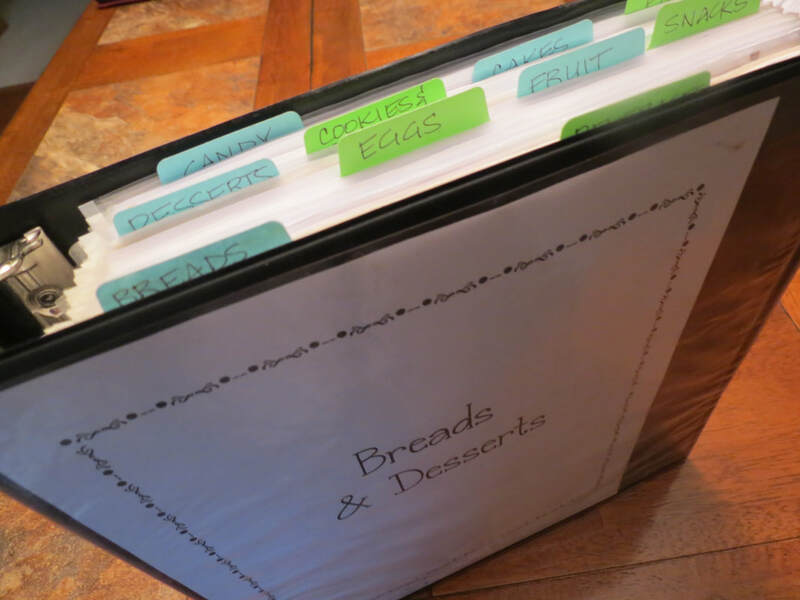 The best method I have found for loose recipes is a simple three ring binder with page protectors. 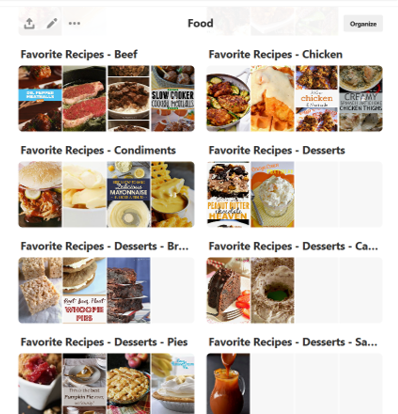 This allows you to organize recipes of all types in one location. Use adhesive tab dividers to separate main dishes from desserts and so forth. As with recipe cards, you can remove individual recipes from your binder and replace them with ease. As your collection expands, you can add more binders as needed. 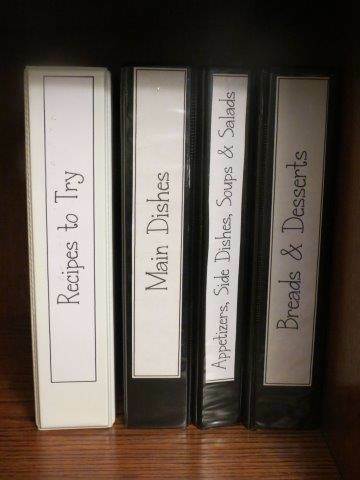 I have four separate recipe binders at this point: one for main dishes divided according to type (beef, poultry, seafood, etc. ), one for appetizers, soups, salads and side dishes; one for breads and desserts; and one for recipes to try. At one point I went through my binders and realized that I had a lot of recipes that I had never even made, some of which I'd had for years. That is when I decided to create a separate binder to organize recipes to try. The first step was to seriously purge my recipes. Then I divided them up according to type within the new binder. When I do my meal planning, I flip through the recipes I haven't tried and choose one or two for a two week period of time. If we like the recipe, I add it to the appropriate binder. If not, I recycle it. In order to make the cut, we have to really like a recipe. Recipes that are just so-so are tossed. Otherwise, my binders get over full of recipes I am not likely to make again given that there are so many better choices available. I have recipes on my computer saved in the same fashion as my printed recipes. Nowadays recipes are plentiful on the Internet through e-newsletters, recipe blogs, and other recipe websites such as allrecipes.com. 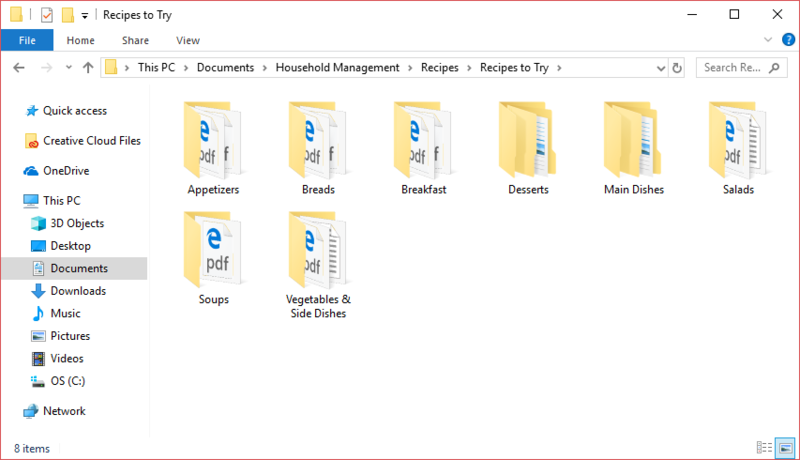 If you like searching for new recipes online, you can save paper and space by saving the recipes to your computer. Print them when you are ready to prepare them or simply view them on a portable electronic device. 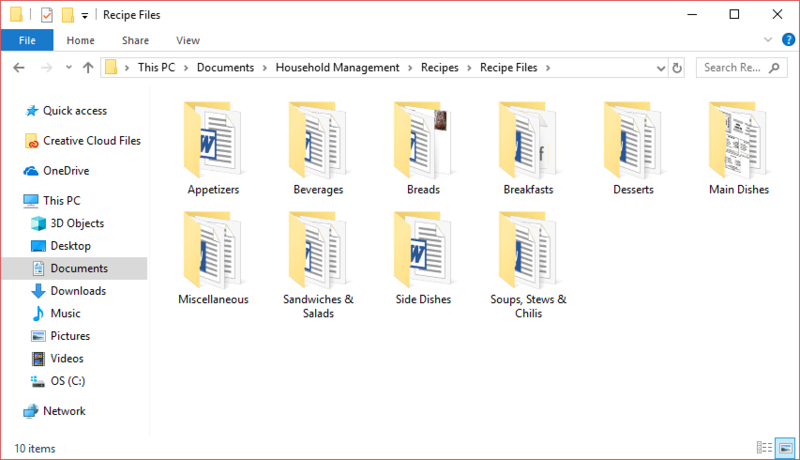 Organize recipes on your computer using different folders and sub folders. For instance, start by creating a folder for Main Dishes. 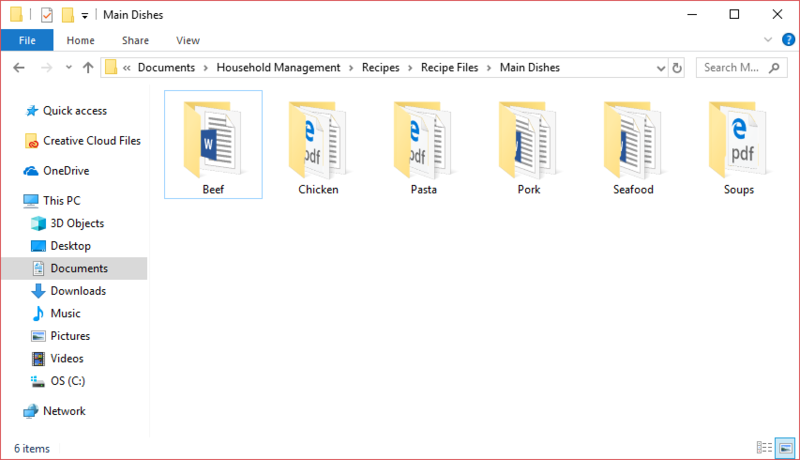 Within that folder, create sub folders for different types of Main Dishes such as Beef, Poultry, Seafood, Pasta, Mexican, and so forth. Recipe Requests: This is where I put recipes I've typed up to share with others. In all likelihood I may have these recipes saved somewhere else, but saving them here makes them easy to find. Chances are if you've received requests for a particular recipe in the past, you are likely to receive them again. Saving them in this format makes sharing simple. 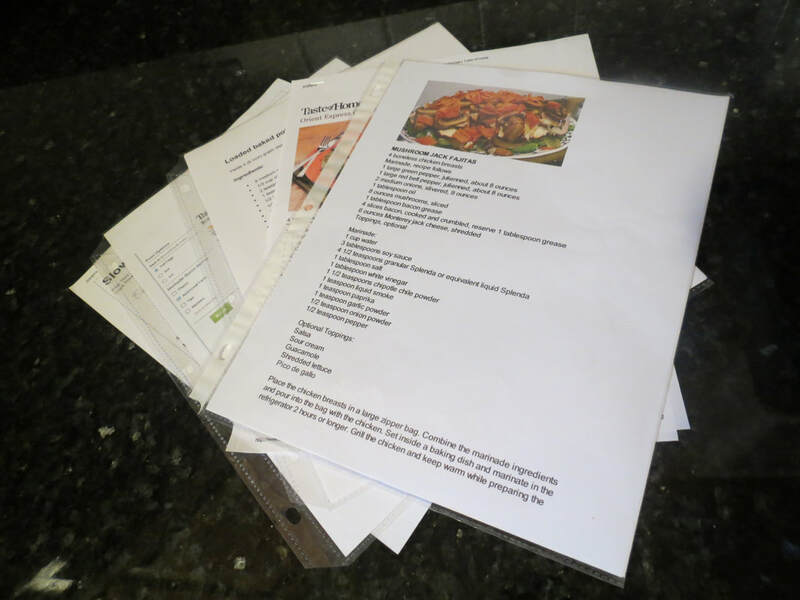 Recipes from Friends: In this folder I keep recipes I have received from friends and family. Why have a separate folder for these? I have a tendency to remember who gave me the recipe, but not what it was called. Storing it in a file designated solely for recipes from friends helps me find what I’m looking for faster. Cookbooks: I have several cookbooks which I have received via email from friends or groups that I have belonged to. These I keep in a separate file as well. I also use this file for cookbook contributions I have made. If you are like me, you have probably been asked on multiple occasions to contribute recipes for a communal cookbook of some kind. I save the recipes I select in a separate file so that I can find them easily if I’m asked to make another contribution. Why reinvent the wheel? If you like a recipe enough to share it once, it will do again. Organize recipes and improve the quality of your cooking. Reacquaint yourself with your recipe collection as you create a system for keeping your recipes organized. 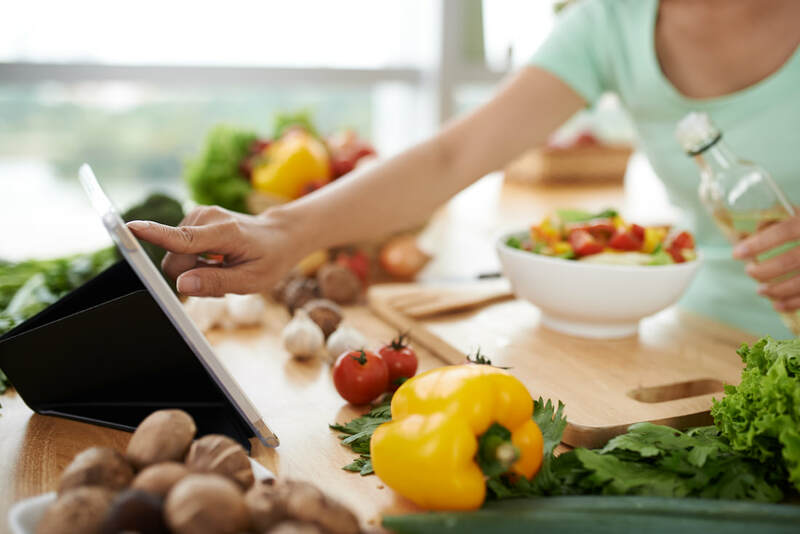 The more comfortable you are with your recipe collection, the more likely you are to use it, and the more you use it, the more likely you are to consistently plan and prepare nutritious, tasty meals. See my Meal Planning page for ideas on putting your newly organized recipe collection to good use. Aside from my recipe binders, these days I get and save most of my recipes on Pinterest. 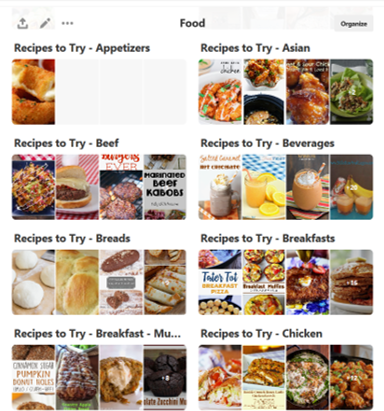 Pinterest recently introduced a 'sections' feature which allows you to break individual boards into different categories, and I love it for organizing recipes. As you can see from the screen shots below, I use it to keep track of both recipes we love and recipes I want to try. I highly recommend it over printing recipes off the internet. I also have a board I call "This Week's Menu". As I plan out what we're going to eat for the coming week, I move recipe pins to this folder so I don't have to search for them when I'm ready to prepare them. Then after I make the recipe I move it back to the appropriate board.